Well it is hard to believe Christmas is almost here again. Normally I would be giving you a tour of my house, but I realize that my home doesn’t look much different than other years. Yes, every year I try to bring out different trees and decorate them a little differently, but I find I keep going back to my favorite things. So I thought I would give you a little peak into my home, a couple of new things (or at least arranged differently) and those favorites. In my kitchen and family room I have a few Santas. This is my Sweet Treats Santa from the book I co-authored with Amy Mogish “Jane & Amy Create Christmas”. I like to bake so that was the inspiration for this piece. 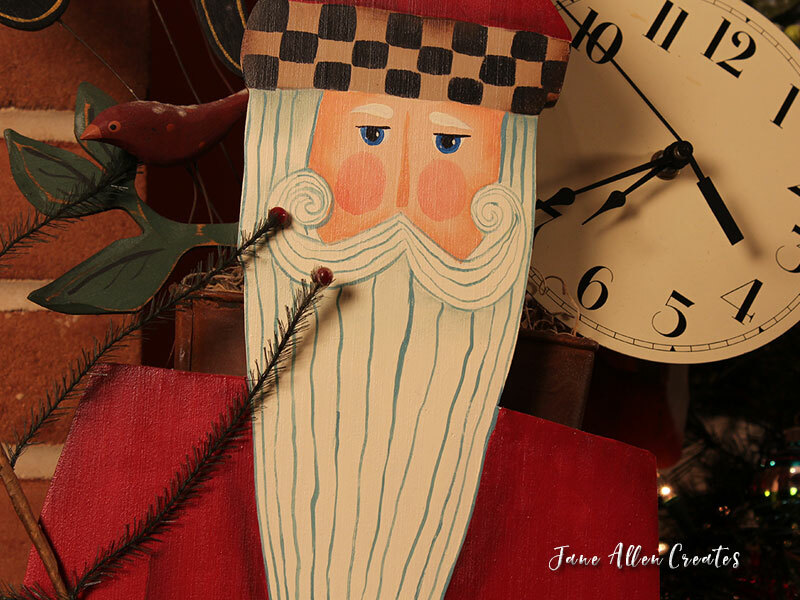 This Santa is a Shara Reiner and it is all about time (Angel Thyme Designs) My father was a jeweler and clocksmith so this sweet guy is a reminder of him. This piece called “Flying School” I created with Wendy Young (Olde Moon Lane Primatives). I love everything about it and it was so much fun to create. Normally my husband helps me get out all of my trees, but this year his back was bothering him…..so I went a little smaller. This tree is at my front window in my living room/dining room. These are Shara Reiner angels on the tree and the box holding the tree is also covered with Shara’s angels. My all time favorite piece that I painted for Christmas is my nativity on my mantel. It was designed by Juliette Martin and painted by me. I had wanted to do it for a long time but kept putting it off. So one year in November I started painting it and got all of the figures done by Christmas. The only thing left to do was the arch which I finally finished a few years ago. Sometimes with all the busyness of the holiday season we forget what Christmas is really all about and what is really important. If we keep our focus on Him we will find the Joy in the Season. Because of him I find hope in this crazy world….and am excited to see what the new year will bring. May you have a very Blessed Christmas and a healthy and happy New Year. Thank you Charlotte may you also have a very blessed Christmas. Thank you for sharing pictures of your beautiful home decorated so beautifully for Christmas! Your little tree is adorable! And love your painted pieces! Merry Christmas and a Blessed New Year! You are right! He is our only HOPE! It all looks so beautiful, Jane. Merry Christmas and Happy, Healthy New Year, my friend. You were one of the best parts of 2017. Thank you Bonnie, it was ajoy to become friends with you and Debbie. Another benefit of creating. Merry Christmas to you and yours and we will look forward to a fun new year. Beautiful pieces, thank you for sharing them with us! May you have a very Merry Christmas Jane and a New Year filled with the very best! Thank you Sandy, you also have a Merry Christmas, I hope we get to create together again in the new year! Your home is a beautiful testimony to your creativity! The nativity is awesome Jane! Merry Christmas to you and your family! Your egg nativity characters are wonderful. I would love to win one. Please put my name in the pot. God bless you for sharing. MERRY CHRISTMAS to you and your family. Your decorations are beautiful, i love the colours you chose for the nativity, absolutely gorgeous! Love seeing your beautiful home and Art…happy place! Merry Christmas…. Thank you Effie, they are actually the colors Juliette used. I do love them though.